Kody Kleber is a versatile and conscientious advocate who makes his clients' needs his first priority. He represents and counsels clients in a range of complex commercial litigation matters, including oil and gas, contract, trademark, copyright, and real estate disputes. He also handles trusts and estates and personal injury defense matters. Kody has extensive experience representing his clients in many different forums, including mediation and arbitration. Represented, as second chair, an operator and working interest owner of an East Texas oil field in an arbitration proceeding against another working interest owner in a dispute concerning joint operations of the oil field. The case settled on favorable terms during the arbitration proceeding. 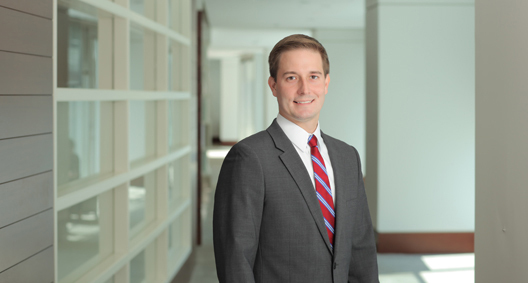 Counsels and defends an offshore drilling company in a federal court breach of contract action related to a deep water drilling project in the Gulf of Mexico. Counsels and defends an energy investment company in a copyright infringement matter in the United States District Court for the Southern District of Texas relating to alleged large scale unauthorized distribution of subscription newsletters. Represented, as second chair, a national charitable organization during a trademark infringement action against a manufacturer of children’s products in the Southern District of Texas. Managed all discovery and motion practice and assisted with a mediated settlement in which the client obtained a stipulated permanent injunction. In a separate case for this client, served as first chair and negotiated a settlement agreement in a trademark action against an individual. Represents and counsels a national bank in trusts and estates litigation matters in Texas. Served as second chair in the representation of a Gulf of Mexico operator in multiple arbitration proceedings, which concerned breach of contract claims arising from an oil production platform explosion. Served as second chair in the representation of a Texas operator in a lawsuit arising from breaches of an Acquisition and Participation agreement. Routinely defends oil field operators and service providers from personal injury suits arising from rig and well accidents. Represented a chemical manufacturer as the plaintiff in two breach of contract suits. Won a motion for summary judgment in one case and negotiated a settlement in favor of the client in the second. Represented a large multinational parent company in a fraud and breach of software licensing and consulting agreement suit involving a dozen independently represented subsidiaries. Negotiated and co-drafted a multimillion-dollar settlement agreement on behalf of the parent company. Represented a manufacturer of gas processing equipment in a suit alleging breach of contract, fraud, trade secret misappropriation and tortious interference against former sales representatives. Managed complex discovery and engaged in extensive motion practice, working to a settlement in favor of the client. While representing a national electronics retailer in a premises liability action in Harris County District Court, argued and won a motion for summary judgment on all claims for the client. Represented a local coatings manufacturer against its insurance company for a loss claim after a building fire. Negotiated a settlement for the full amount of the client's claim. Represented a partner to a real estate development partnership in an arbitration dispute with development partners concerning the development of partnership property. Represented and counseled a national healthcare provider in landlord-tenant disputes in multiple states. Represented a recycling technology company in dual federal and state court breach of contract suits concerning the use of jointly developed technology. Won a motion to remand one federal case back to state court and won a motion to dismiss a parallel federal court case. Drafted federal circuit court briefs for the matter as well. Ultimately assisted in achieving a settlement favorable to the client. Served as second chair while defending an Internet retail company in trademark trial and appeal board opposition proceedings brought by the operator of a search engine website, managing discovery and drafting all case filings. Assisted with obtaining a settlement in favor of the client, in which the plaintiff agreed to dismiss all oppositions with prejudice. Represented an online marketplace services company in responding to a civil investigative demand from the Texas Office of the Attorney General’s Consumer Protection Division. Represented a natural gas exploration company in a joint Department of the Interior and Bureau of Land Management grand jury investigation into charges of mineral trespass. Represents the Houston Zoo as litigation counsel and in negotiating and drafting various vendor, supplier and services contracts. As a volunteer prosecutor with the Houston Municipal Court, tried more than a dozen misdemeanor cases to jury verdict. Served as an arbitrator on multiple arbitration panels charged with deciding fee disputes between attorneys and clients through the Houston Bar Association.